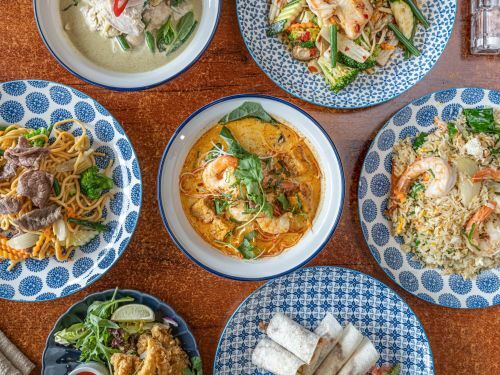 Gao Thai uses their own specialised couriers to deliver their food. Deep fried vegetable spring roll, vermicelli noodles served with sweet chilli sauce. Steamed wonton pastry filled with pork mince served with black vinegar sauce. Puff pastry filled with mixed vegetable served with sweet chilli sauce. Deep fried golden sachet of chicken minced, peas, corn and carrot served with sweet chilli sauce. Minced fillet fish mixed with special chilli paste, green bean served with chilli sauce. Grill marinated chicken sticks served with peanut sauce. Spring roll, curry puff, money bag and fish cake served with sweet chilli sauce. Crispy roasted duck with cucumber, shallot and carrot wrapped in the thin pancake topped in Thai special sweet sauce. Deep fried salt & pepper squid served with sweet chilli sauces. Deep fried crab claws served with plum sauces. Stir fried mixed vegetables with sweet and sour sauce. A famous spicy stir fried with mixed vegetables, chilli, basil and sweet basil sauce. Stir fried mild chilli jam with mixed vegetables and cashew nut. A classic stir fried with mixed vegetables in oyster sauce. Stir fried garlic and pepper with mixed vegetables in garlic and pepper sauce. Stir fried pad prik khing curry paste with mixed vegetables. Fresh ginger, shallot, shiitake mushroom and mixed vegetables. Stir fried homemade peanut sauce and mixed vegetables. Stir fried black bean sauce with mixed vegetable. Stir creamy sauce with mixed vegetables. Thai style marinated char grill beef served with stir fried mixed vegetables and Thai special sauce. Char grilled marinated chicken thigh fillet with Thai herbs and spices served with stir fried mixed vegetables and sweet chilli sauce. Char grilled marinated pork served with Thai special spicy sauces. Char grilled marinated squid served with stir fried mixed vegetables and homemade sauce. BBQ lover of combination chicken, beef and pork served with Thai special sauces. Char grilled marinated garlic and pepper lamb cutlets served with stir fried vegetables. Char grilled king prawns served with stir fried mixed vegetables, salad and homemade sauce. Thai curry flavoured with green curry paste chilli and coconut cream, mixed vegetables and basil. Thai curry flavoured with red curry paste chilli and coconut cream, mixed vegetables and basil. A delicious panang curry, coconut cream with carrot, mixed vegetables and basil. A mild yellow curry with coconut cream, potatoes and vegetables. Braised chunky tender beef cooked in thick mild curry served with potatoes and cashew nut. Stir fried mixed vegetables, bok choy, shiitake mushroom, tofu and with oyster sauce. Stir fried pumpkin mixed vegetables, tofu and egg with oyster sauce. Deep fried battered tofu served with steamed Chinese broccoli with oyster sauce. Stir fried bean sprouts with tofu in oyster sauces. Stir fried crispy pork belly, Chinese broccoli, and chilli, garlic, vegetables, soy bean with oyster sauce. Mixed seafood in garlic, chilli, lime leaves and peppercorn stir fried in special sauces. Crispy pork belly stir fried with onion, vegetables and chilli basil sauce. Stir fried crispy pork belly with bean, carrot, kafir leaves and vegetables in pik khing sauce. Stir fried baby clams in chilli jam, basil and young peppercorn. Deep fried king prawns, lightly marinated with mixed salad served with sweet tamarind sauce. Crispy pork belly served on steamed Chinese broccoli top with soy vinegar chilli. BBQ pork served on steamed Chinese broccoli top with soy vinegar chilli. Deep fried battered soft shell crab with mixed stir fried vegetables topped chilli jam. Battered soft shell crab stir fried with black pepper, onion, shallots and vegetables in the Thai special sauce. Stir fried prawns with mixed vegetables, chilli, pepper corn in curry sauces. Thai crispy pork belly with beans, vegetables served with Thai sweet special gravy sauce. Deep fried battered soft shell crab tossed with mixed salad, red onion, tomatoes with coconut in chilli jam sauces and lime dressing. Char grilled salmon with mixed salad, red onion, tomatoes with coconut in chilli jam and Thai spicy sauce. Char grilled king prawns with stir fried thin rice noodles, egg and bean sprouts served with crushed peanuts. Roasted duck served on steamed Chinese broccoli top with soy vinegar chilli. Boneless tender roasted duck with plum sauce, shiitake mushroom served with stir fried vegetables. Deep fried whole barramundi, cherry tomato, red onion, mint, mixed salad and chilli lime dressing sauce. Steamed whole barramundi with ginger, shallot and chilli in ginger soy sauces. Deep fried whole barramundi with, tomato, red onion, mint, mixed salad and chilli lime dressing sauce. Deep fried whole barramundi with crispy basil, mixed salad and sweet chilli sauce. Char grilled king prawns, squids with mixed salad served with Thai special sauces. Steamed whole barramundi with mixed vegetables topped with Thai lime dressing sauces. Steamed whole barramnudi with Chinese broccoli topped with Thai limes dressing sauce. Char grilled salmon fillet with mixed vegetables topped with choo chee sauce. Thai style fried rice with eggs, peas, carrots, shallot and top with crab meat. Thai style fried rice with Chinese broccoli, onion, tomatoes. shallot, egg and onion. Thai fried rice with yellow curry powder, onion, carrot, tomato, shallot and pineapple. Classic pad Thai stir fried with egg and bean sprouts served with crushed peanuts. Stir fried thick rice noodles with egg, Asian greens vegetables in sweet soy sauce. Thick rice noodles with chilli, egg Asian greens vegetables and chilli basil sauce. Stir fried noodles mixed vegetables with mild chilli jam, egg and cashew nut. Stir fried noodle and mixed vegetables with homemade peanut sauce. Classic pad Thai stir fried with BBQ pork, egg and bean sprouts served with crushed peanuts. A stir fried hokkien noodles with oyster sauces, eggs and mixed vegetables. Shredded green papaya tossed with lime juice, roasted peanuts, chilli and tomato. Marinated char grilled beef with mixed salad, coriander, red onion, carrot, chilli and lime dressing. Chicken mince served with mix salad, carrot, red onion, chilli, lime dressing and ground rice. Marinated char grill chicken thigh fillet served with mixed salad, carrot, red onion, flavoured with coconut milk, chilli and lime dressing. Vermicelli noodles salad with mixed seafood, salad, carrot, red onion, chilli and lime dressing. Deep fried battered soft shell crab tossed with shredded green papaya, lime juices, roasted peanuts, chilli and tomatoes. Char grills salmon with shredded green papaya, lime juices, roasted peanuts, chilli and tomatoes. Deep fried battered soft shekk crab, mixed salad, mint, red onion, tomatoes with chilli and coconut cream lime dressing sauce. Thai creamy coconut soup with chicken breast, mushroom, tomatoes and red onions top with coriander. Thai Spicy tom yum paste with prawns, mushroom, red onion and coriander. Clear soup with chicken, carrots, beans sprout, vermicelli noodle and top with coriander. Chicken minced wonton noodles soup with vegetables, coriander, shallots and beans sprouts. Thii fried rice with eggs.